Although superstring theory says the bulk has six more dimensions than our universe, there is reason to suspect that, for practical purposes, the number of extra dimensions is really only one. Why does Kip Thorne - one of the world's most respected physicists - tell us that it's fair game to refer to the fifth dimension as somehow including all of the other dimensions? Can we really ignore the rest, and say that beyond our 4D space-time there is really only one more dimension that matters? I think this agrees very nicely with my contention that our observed space-time reality is actually being derived from the fifth dimension. Ultimately we're just talking about extra-dimensional patterns of information, and how their configuration has created a unique universe such as ours. As creatures made of atoms and molecules that are confined to a 3D brane using the fourth dimension to change from state to state, most of the interesting stuff for us really is just at the fifth dimension: the dimension which Einstein accepted is where the field equations for gravity and light are resolved, the dimension I insist Everett must have been pointing to when he said his probabilistic "Many Worlds" occur within a sub-space which is orthogonal to space-time. So what's beyond the fifth spatial dimension? The point-line-plane postulate tells us that each time we want to get to an additional dimension, we have to imagine a point not found in the current system, the current "dimension" (no matter what you're defining that word to mean). So to get to the sixth dimension as a mental construct, we have to think about the things that would be impossible to observe from the fifth dimensional point that represents our observed reality right here and right now. And as I've said before, if you're thinking about an underlying extra-dimensional form which includes all possible universes, all possible patterns of information, then for us everything up to our version of the fifth dimension includes the patterns that align to create our unique universe, the one we are currently observing, and everything beyond this fifth dimension is a way of thinking about the other patterns that could have aligned to create some other universe different from our own. Quantum physicists like Seth Lloyd and Anton Zeilenger use this phrase to talk about their work: "information equals reality". Are you and I and the world we see around us really just patterns of information? If that's the case, then I'm proposing that each awareness within this observed reality is just a pattern recognizing itself. And when we back our theoretical viewpoint out to the biggest picture of all, we are seeing an underlying sea of potential information, some of which creates patterns that are static and unchanging, some of which are like you and I: moving patterns that grow and change. All of those potential patterns considered together cancel each other out to become a perfect and naturally balanced symmetry state, and a universe such as ours results from a breaking of that symmetry. Gevin Giorbran described this idea so eloquently in his fascinating masterwork, Everything Forever: Learning to See Timelessness. Incidentally: in the years since Gevin's untimely death, there has been evidence that this "supersymmetry" notion, at least as physicists have described it up to now, doesn't jive with the underlying structures of our reality being revealed by the LHC. Does that matter? That depends on whether you're willing to look at randomness and chaos as being another way of describing the same "everything" from which our universe or any other is derived. Because whether we came from nothing or whether we came from everything may simply be different ways of describing this underlying information that becomes our reality. Haven't we all been fascinated to look in the eyes of another living being and glimpse that spark of awareness, perhaps alien to our own but still hauntingly familiar? And isn't the mounting interest in Artificial Intelligence part of this discussion? 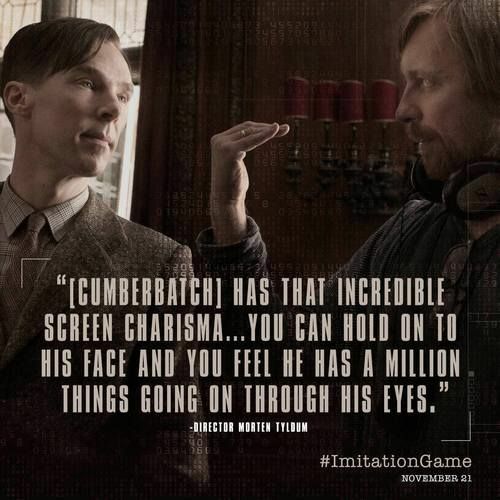 In The Imitation Game, we see an amazing performance from Benedict Cumberbatch, no doubt one of the finest actors of his generation. That film, like Her, encourages us to consider the possibility that a machine, a dance of electrons within a collection of circuits, could develop this same kind of awareness: perhaps alien to our own but still hauntingly familiar. The alarm being raised lately by luminaries like Stephen Hawking and Elon Musk* about the coming dangers of AI may have to be accepted as yet another stage in the evolution of life on this planet. The beginning of life in the primordial ooze, I've proposed, can be thought of as an extra-dimensional pattern which recognizes that if it chooses "this path rather than that one" from its fifth dimensional probability space, it will be more likely to continue. Could a "desire for continuance", then, become a handy delineator for saying which things are alive and which are not? If we were able to observe our reality from "outside" the fifth dimension, I believe that these patterns that represent life, awareness, and even those "spooky" connection patterns like the ones we looked at last entry, would be immediately apparent. Next Entry - "What's Beyond the Fifth Dimension?" When you said that "and everything beyond this fifth dimension is a way of thinking about the other patterns that could have aligned to create some other universe different from our own", aren't all those patterns the observed patterns of the fifth dimension. Even the beginning of time is a choice whether to start or not and so a part of the fifth dimension. I don't understand the concept of 'beyond fifth dimension' from the paragraph where you described it. Can you please provide another perspective on that. Hi IRavi, thanks for your note. For me, this discussion is about the degrees of freedom added by each additional spatial dimension. I have seen similar comments to yours from people who believe all extra dimensions don't exist - in effect, if the fourth dimension can extend from the beginning to the end of the universe, and that would be true for any universe you care to imagine, why do we even need the fifth dimension? Likewise, some have argued that you need nothing beyond the third dimension, since time is not a full dimension and is merely the way of describing change from state to state within the third dimension: so any universe you care to imagine would only need the third dimension. In my blog entry Imagining the Fifth Dimension I quote from a letter I wrote to physicist David Deutsch. It explains more fully my belief that the extra dimensions beyond the fifth help to explain why our version of the fifth dimension never "wanders off" into one of those other different-initial-conditions universes: because that is not within the degrees of freedom offered to us by the five spatial dimensions.